Blepharitis is an inflammatory condition affecting the eyelid edges, causing symptoms of soreness, dryness, foreign body sensation and irritation. The eyelid edges are typically red, thickened and irregular, and may have crusting or oily discharge. The eyes may be normal, or may become red and sore as well. Symptoms are usually worse on waking and towards the end of the day, or in smoky and dirty atmospheres. Vision is unaffected. 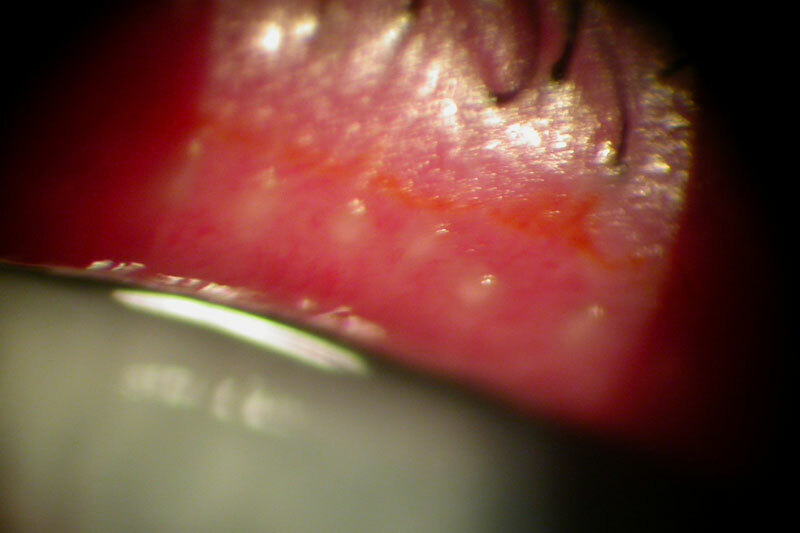 Blepharitis is caused by the irritiant effects of eyelid secretions, debris and waste products of bacteria normally present on the lid margin, and by excessive response of the patient’s immune system. 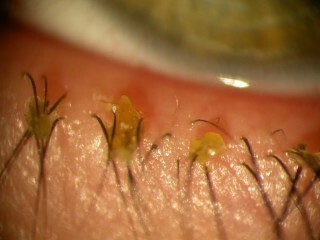 Some people are prone to blepharitis and will experience waxing and waning of symptoms over many years. People with Rosacea (a skin complaint affecting the cheeks and nose) are particularly prone to troublesome blepharitis. Blepharitis may begin at any age. The mainstay of treatment for blepharitis is Lid Hygiene. Additional treatments include antibiotic drops or ointments, and oral treatment with tetracyclines, e.g. lymecycline (Tetralysyl). Commercially available ready-made lid cleaning solutions and wipes are now available and be purchased over the counter from pharmacists shops. Alternatively, it is possible to make your own solution for eyelid cleaning. Place a level teaspoon of baby shampoo in a clean jar of boiled water. Allow it to cool and make sure the shampoo has dissolved. This solution can be used for one week and then replaced. Dip a clean cotton bud in the solution and rub along the eyelid edge and base of the eyelashes, removing any visible crusting or discharge. Use a new cotton bud for each eyelid, and do not rub the inside of the eyelids or the eye. Repeat this morning and evening until symptoms are settling, then maintain lid hygiene once a day to help prevent further problems. Chalazion is a blockage of meibomian glands of lid. This may settle spontaneously or instead require surgical incision and curettage. (See “Chalazion” information leaflet). Marginal Keratitis is a severe inflammation of the cornea secondary to an immune system ‘over-response’, where the cornea becomes inflamed and may ulcerate. The affected eye becomes red, sore, light-sensitive and may have blurred vision. Steroid eye drops usually result in rapid improvement.